Pouches, Coins, and Lollipops, Oh My! Remember that pouch that I was supposed to make for the zippered pouch swap at my guild? I finished it in the wee morning hours the day of the meeting. I had a few false starts trying to figure out what to do, but in the end opted for a patchwork of strings. Can’t get enough of those strings, can I?!? I slipped on a split ring on the side and attached a matching key fob. Since my partner asked for a coin pouch, I added a few coins to get her started and then breathed a sigh of relief! The pouch is now with its new owner. And look what I brought home with me! Jenny from Squawk made this cute little dumpling pouch to help me keep my jumbo-sized bag organized. I love the stitching on the outside and the zipper that opens all the way. Inside was a stash of organic lollipops! Did you know there was such a thing as organic lollipops? This is sweet news to me! 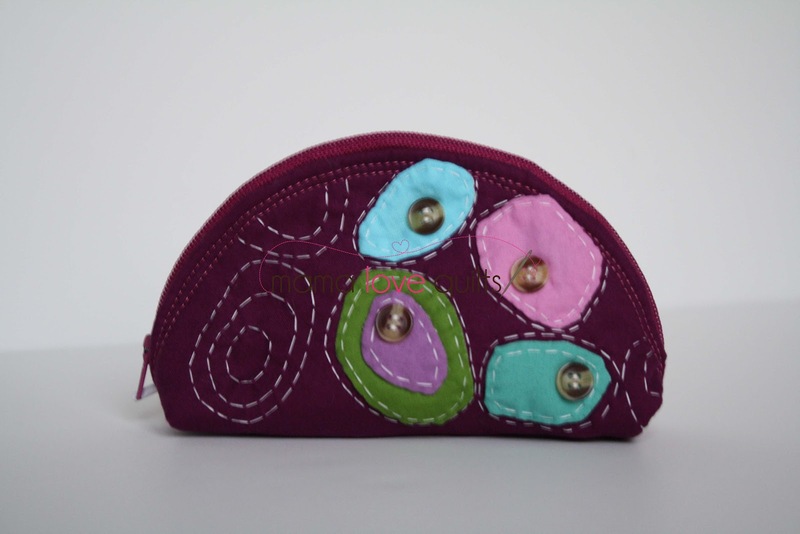 Very cute pouches Nicole – I was always told that it is unlucky to give a coin purse without some coins in it! oh both pouches are so sweet! Love the detailing on the pouch your received! What darling pouches. I wonder ig my daughter in law would let me give my granddaughter organic lollipops? Very cool pouches Nicole – love the one you made especially! Super great pouches! Thank you for sharing. So cute! I especially love the one you made. Such a great idea to attach that key fob! Both very cute swap items. Happy sucking!